Visit this page often to see new digital space art. Images from this page eventually end up on the Gallery page. Click on a thumbnail to see a larger JPEG image. Some of the images are very large, so be patient while they load if you have a slow connection. Then use your browser's "Back" button to return to this page. 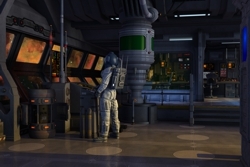 Given that future space explorers will probably make use of sophisticated scout, reconnaissance and possibly combat mechs as they conduct their missions to planets orbiting distant stars, their spacecraft will have to contain a repair and refurbshment bay where technicians will keep such mechs in peak operating condition. Here's what such a servicing bay might look like. Robots have been a staple of science fiction literature and cinema for decades. An early version of a cinematic “mech,” as we understand the concept today, was the homicidal ED-209 from the original 1987 film “Robocop.” Mechs have appeared in films such as the “Transformers” series, “Iron Man,” “Aliens,” “Avatar” and many others. In literature, the late Robert A. Heinlein virtually defined the genre in his novel “Starship Troopers” (although, sadly, the execrable 1997 movie of the same name totally ignores the idea). 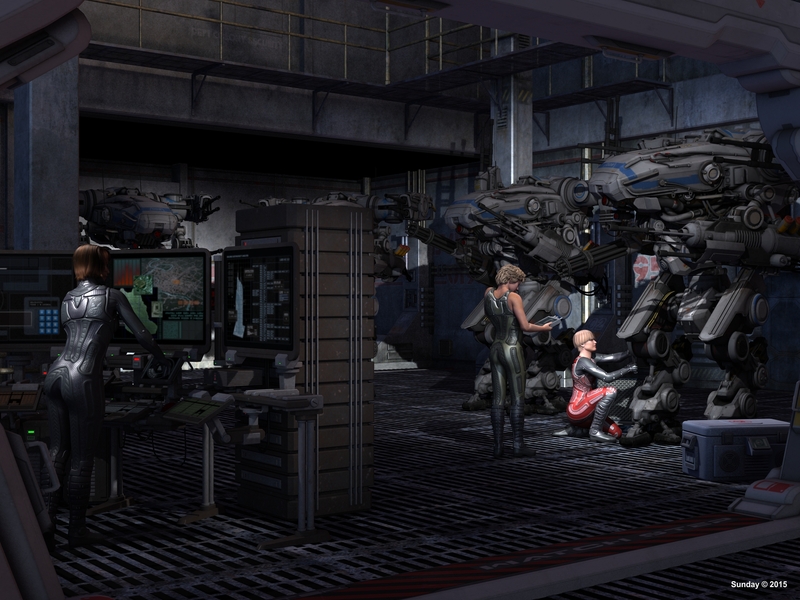 Some mechs are powered exoskeletal suits designed to augment the strength of their human wearers. Others are autonomous robots, usually heavily armed and often up to no good. 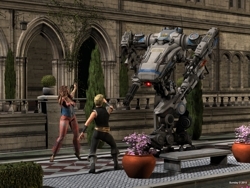 In the spirit of not letting any 3D objects or rendering work go to waste, here are a few images of a mech on the rampage in an idyllic courtyard of the type that might be found in a large European city. The swordsman and the “harem girl” fight a pitched battle of primitive weapons versus high technology, with the outcome in doubt. Will the two intrepid characters end up in the clutches of the dastardly mechanical contraption? Does anyone care? Except for the old Skylab, all spacecraft built up to the present, including the International Space Station, have been too small and cramped for the astronauts aboard to really enjoy themselves in the micro-gravity environment. Some distant day in the future, however, spacecraft may be commodious enough to permit their crews to relish unrestrained zero-G hijinks. Such a scene might look something like this. 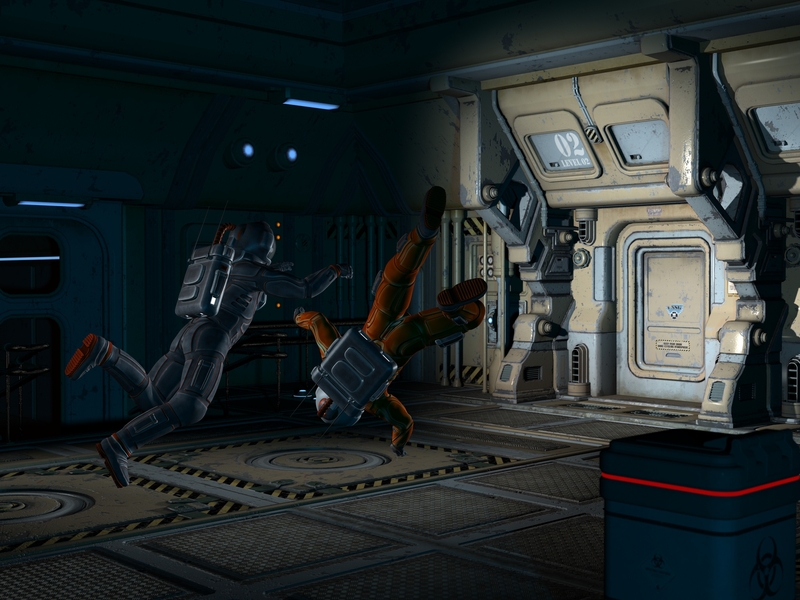 Here a rookie crew member aboard a large interplanetary cruiser, appropriately attired for the occasion, takes advantage of the lack of gravity to perform acrobatic feats that would be impossible in any other environment. Her radiant expression of joy and excitement tells it all. Who says humans will get along any better in the future when--or if--they move out into space? 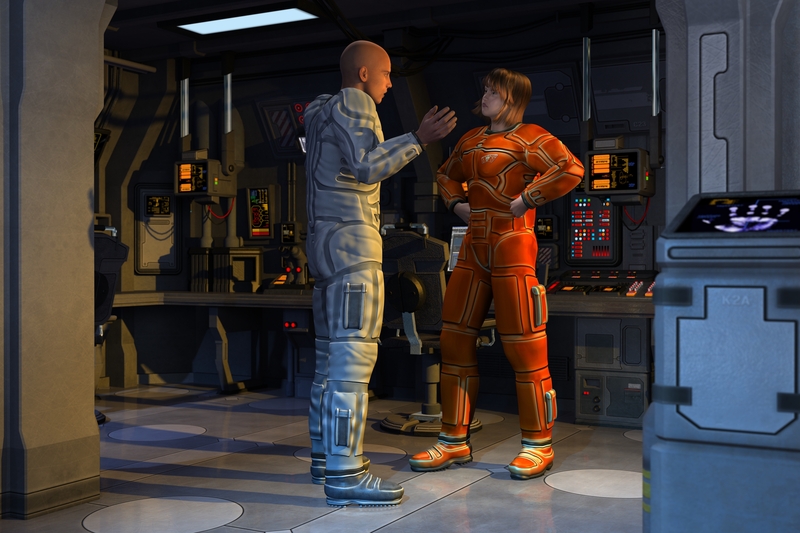 In this DAZ3D image, there seems to be a disagreement between two of the crew members of an interstellar spacecraft in one of the control rooms. One of the neat things about DAZ3D is how renders can be set up to simulate actual camera characteristics, such as lens focal length, f-stop setting, focus distance, depth of field and so on. Here you'll notice that the foreground and background are slightly out of focus, because the "camera" is focused on the two figures. This capability allows for endless experimentation and can create some truly realistic-looking renders (not that this is one of them). 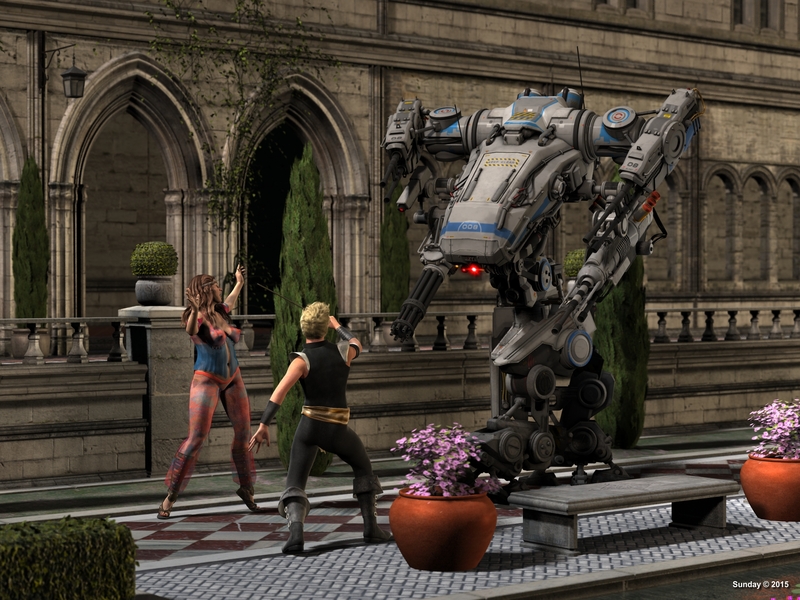 Here's another quick DAZ3D render. They're getting more complicated as I learn the program, and the lighting in particular is getting more sophisticated. 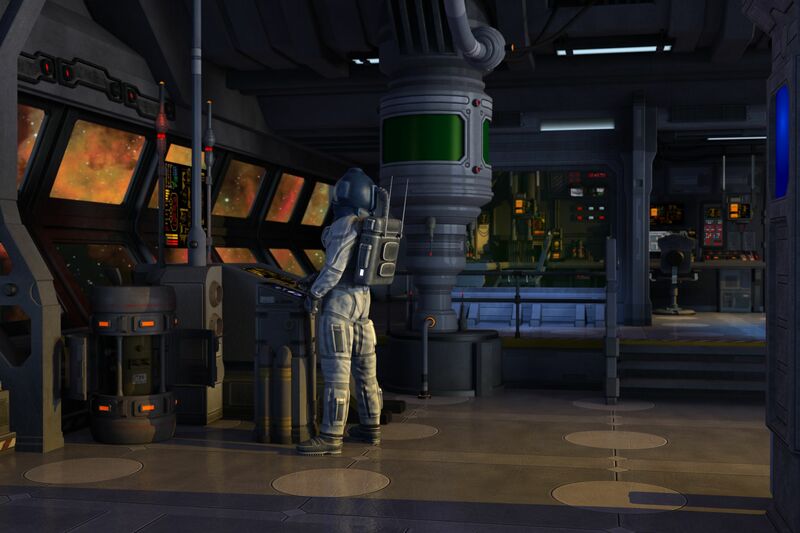 This one has four lights--the blue one illuminating the rear of the bay, a bright white helmet light, a white light pointing back from the door to simulate the reflection of the helmet light and a rim light out of the scene to the left rear to make the two space-suited figures "pop" off from the background. 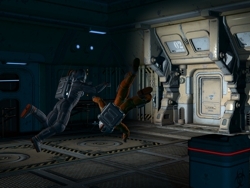 Again, check back soon for more images--and some of them won't be space scenes. If that sounds intriguing, bookmark this site and take another look later. 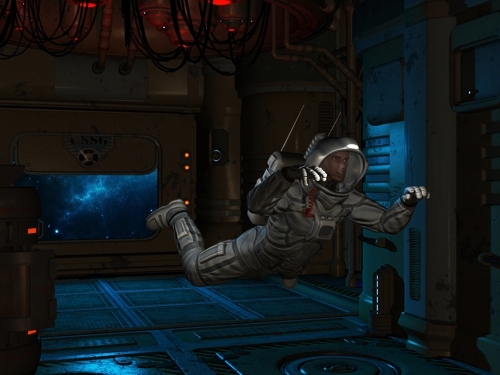 These two images are a couple of quick-and-dirty, out-of-the-box renders that I did to test out a new 3D modeling software package called DAZ3D. This package is quite a bit different than trueSpace (which is apparently defunct) in that its forte is more figures and "fantasy" art than high-tech mechanical devices. I'm still in the process of learning it, so these images are just some very simple examples of what DAZ3D can do. The figures and backgrounds are "content" for sale on the DAZ3D website, which is apparently how the company makes money--the rendering software is free. Check back soon for more images that will be very different than anything you've seen on this site before. 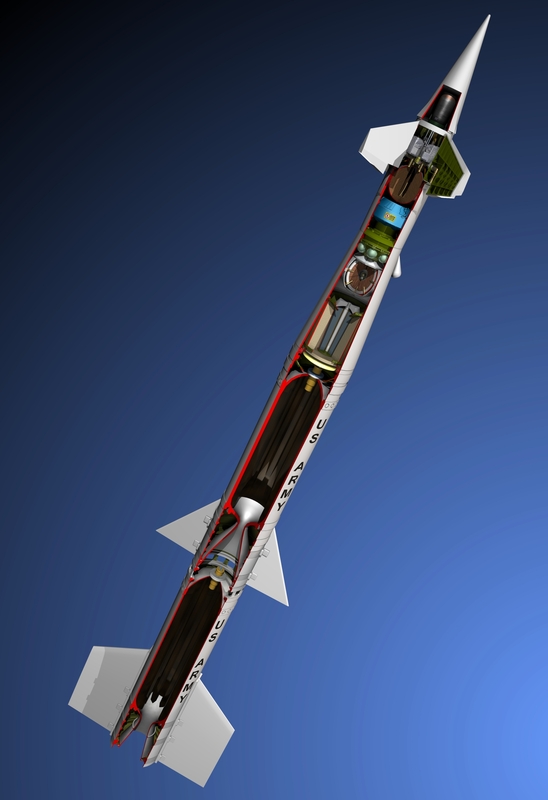 This detailed cutaway of the McDonnell Spartan anti-ballistic missile was prepared at the request of an author who is writing a book about parts of the project. It may some day end up being published. In the meantime, it showcases the abilities of trueSpace to accurately depict the intricacies of highly technical objects. I modeled much of Spartan from scratch, but resorted to using my old model of the two-stage thermonuclear warhead. Again, I have no idea whether that part of the model is accurate. I have high confidence, however, about the accuracy of the first- and second-stage rocket motor sections and the guided third stage, which is interesting because it steers itself by means of gas from a gas generator that exhausts from the fin roots (you can see the hot-gas ducts). Here's a quick-and-dirty rendering using three components generated by three separate software programs and then composited together. 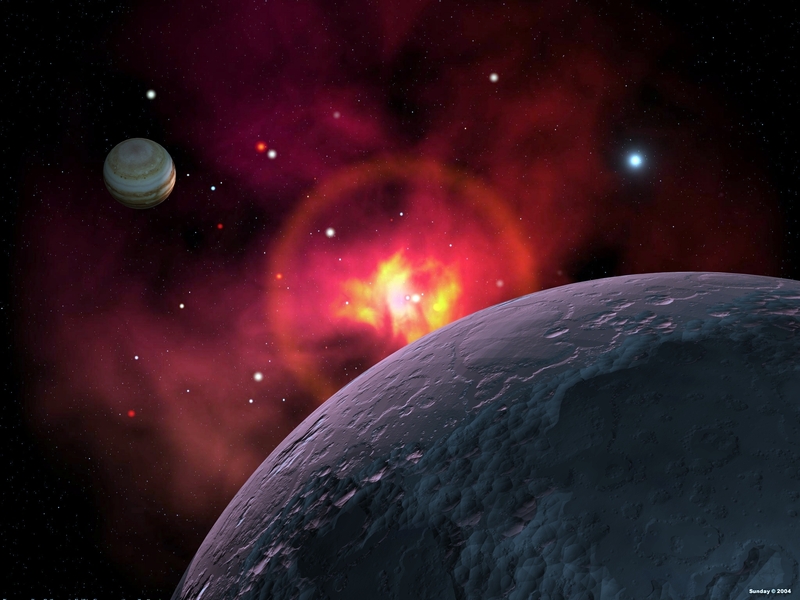 The nebula and star background is from DarkTree Textures, a procedural texture generation program from DarkSim. 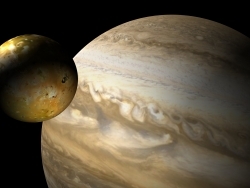 The planet is a high-resolution NASA map of Jupiter wrapped around a flattened sphere and rendered in trueSpace. Finally, the pocked and cratered surface of the asteroid in the foreground was generated in Bryce. I had to take care to match the lighting between the Bryce and trueSpace components, but other than that the creation of this simple image was very straightforward. Here's an even simpler image, with both Jupiter and its volcanic moon Io rendered in trueSpace using high-resolution planetary maps. I elected to leave the background solid black here rather than make it"starry." In general, a person viewing bright planetary objects such as these from close up would not be able to see background stars anyway, because the pupils of his or her eyes would be relatively tiny due to the brightness of the nearby objects. Somewhere deep in the outer reaches of a distant galaxy, a star goes nova. An expanding sphere of superheated plasma surges outward from the dying star, leaving turbulent clouds of hot gases in its wake. 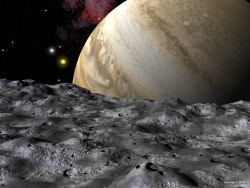 This scene is viewed from above the surface of one of the moons of a Jupiter-type planet in orbit around the star. The moon's orbit is inclined to the planet's equator--here it is above the "northern" hemisphere. Soon both the planet and its moon--as well as all of the other objects in this stellar system--will be consumed by the nova explosion. 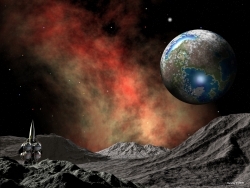 The surface of the moon is a DarkTree procedural texture, as are the gas clouds around the star. 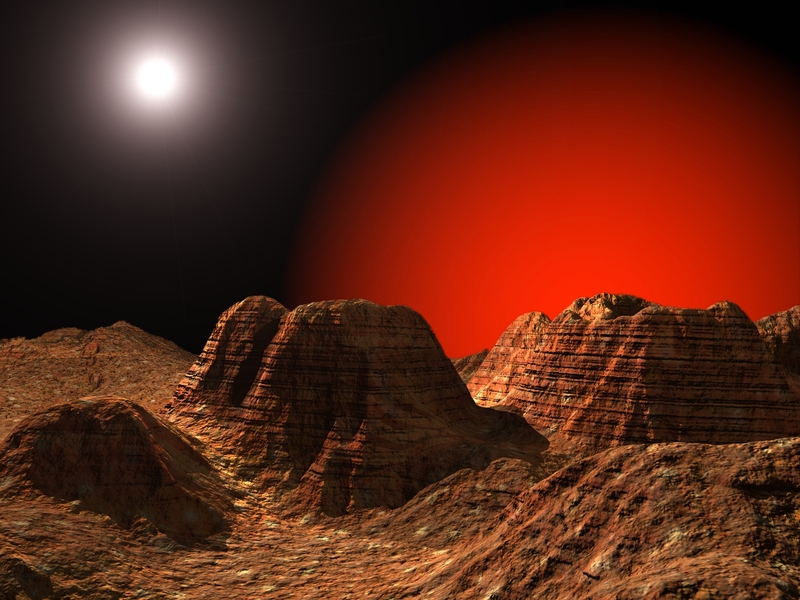 The surface of a planet in a double star system is likely to be a very hostile place indeed. The complexities of such a planet's orbital motions around its two primaries would very likely prevent any life from ever developing, and the planet would probably be harsh and barren. This image shows the view from an earth-sized planet in a stellar system consisting of a red giant and a main-sequence star. The planet's surface is dry, baked and lifeless. The cycles of heat and cold as the planet moves in its complex orbit, combined with wild winds generated in the atmosphere from diurnal heat flux variations, tend to erode any mountains that may arise from tectonic forces. Low mesa-like formations are the only significant geological formations that ever form. Okay, so this image is just an excuse to recycle some old trueSpace models in a new setting. The laws of physics are the same throughout the universe, as far as we know. Thus engineering problems, such as spaceflight and atmospheric entry, will probably have similar solutions regardless of where they are developed. For example, any technological society will inevitably conclude that a sphere is the best shape to carry propellant in the absence of atmosphere. Similarly, a body streamlined for efficient flight in atmosphere must obey certain common physical principles. Here I have used the departure tanks from the von Braun-Bonestell moonship and a Bonestell-type streamlined rocket to construct this very hypothetical extraterrestrial spacecraft. 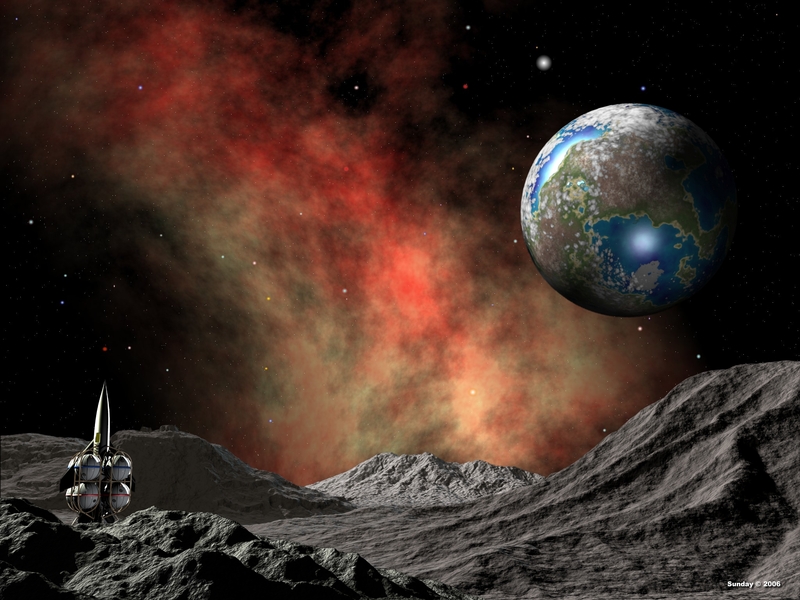 The gas clouds in the background are from DarkTree Textures, the moon's surface is from Bryce (with a lot of tweaking), and the planet and spacecraft are both trueSpace renderings.